Almost 90 years ago, Nels J. Johnson's essential purpose for establishing the tree service company that bears his name is to provide superior care for the landscape trees and shrubs of homeowners and commercial and public landscape managers. 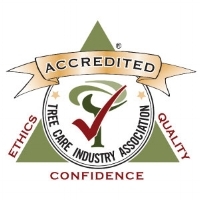 The Tree Care Industry Association (TCIA) is the only industry organization that inspects and accredits tree service companies based on strict adherence to industry business ethics, consumer satisfaction, and technical competence. Since 1930, Nels Johnson Tree Experts has proudly carried on our long tradition of excellence as evidenced by our TCIA accreditation. You can call us knowing our company meets the most stringent criteria in industry-approved tree care practices, while providing the highest standards of ethical, reliable service.